Where traditionally people try to design technology with goals such as efficiency, accuracy, and ease-of-use, ludic interfaces instead aim to prioritise a different set of ideals, such as play, user-generated content, and co-operation. Ludic interfaces are typically low-cost and aim to encourage playfulness (as you can see from the name’s origins in the word ‘ludicrous’). 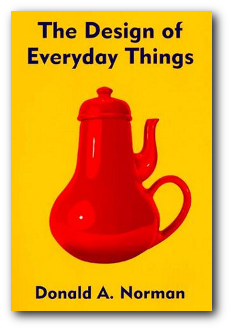 They remind me of the ‘impossible things’ found in Don Norman’s ‘The Design of Everyday Things’, including the teapot with a spout over its handle, and a bicycle which pedals in both directions simultaneously. However, unlike those items, these ludic interfaces perform a function. Today we’ll look at examples of Ludic Design, and what this means for including users in design. Dr Chris Frauenberger also told us about a ludic Sat Nav. Unlike traditional Sat-Nav’s, which aim to get you to your destination in the minimum amount of time, this Sat Nav takes the driver a long and pointless route to their destination, hence introducing the idea of fun and playfulness into the typically utilitarian task of driving to a destination. So what is the significance of ludic interfaces to participatory design? The origins of ludic interfaces are rooted in computer games, art experiments and interactive media, and hence encourages people to think and act creatively, breaking outside of their normal boundaries. This can be especially useful when working with people in a typically ‘serious’ setting, such as within a workplace. This can also be seen as a way of putting on a “green hat” in the Six Thinking Hats model created by de Bono. The second benefit of using a non-traditional interface or method when approaching a problem is that it helps break down social barriers that pre-exist within the group. Often, due to factors such as organisational hierarchy or existing relationships, participants can be less than forthcoming with ideas, feedback or co-operation. By presenting the ideas in a non-traditional way, and allowing people to engage in a ‘fun’ manner, ludic interfaces help prevent this reservation and allow everyone to participate fully.